Bosnian government institutions and public companies spent around 4.5 million euros on purchasing vehicles in the first six months of 2018, BIRN’s new database shows. In the first six months of the year, around 4.5 million euros was spent on vehicles for government officials, institutions and public companies in Bosnia and Herzegovina, according to BIRN Bosnia’s new database. Of this sum, 1.5 million euros were spent on cars, some of them luxury models. The other three million euros were spent on vehicles like fire trucks, ambulances and SUVs. A total of 292 tenders were issued to purchase the vehicles, but in more than 70 per cent of the tenders that were fulfilled, only one company applied, the database shows. Bosnian government institutions and public companies published tenders to purchase 563 vehicles during the six-month period, around half of which were passenger vehicles and SUVs. So far, 106 tenders have been fulfilled to buy 213 cars – 128 of them new and 38 secondhand, and in the other cases details have not been made public. The most expensive vehicle purchased in the first six months was for the medical faculty of the Mostar University, in a tender worth 50,000 euros. Mostar medical faculty dean Milenko Bevanda first issued the tender in late 2017, but annulled it after receiving BIRN’s request for a comment about the purchase. 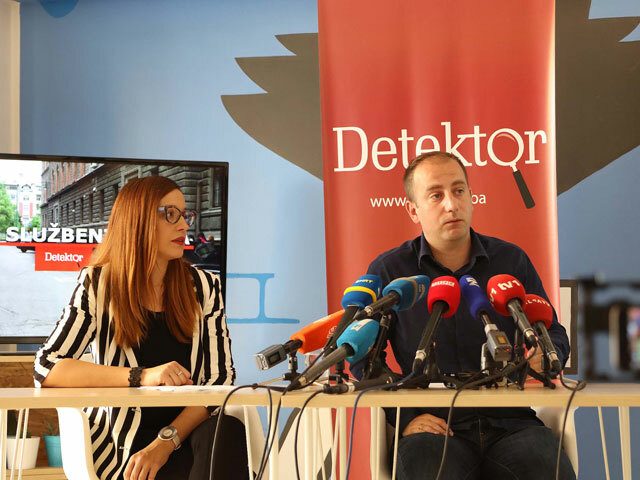 But in spring this year, Bevanda repeated the tender and bought a new vehicle worth 42,300 euros without taxes from the MRM company in Ljubuski. BIRN’s database shows that in the first six months of this year, MRM won the most valuable tenders, worth over 375,000 euros. Porsche BH from Sarajevo won the most tenders, valued at a total of 285,000 euros. Of the 292 issued tenders in the database, BIRN marked 26 tenders in which the requested specifics of the vehicle are so detailed that they can limit competition or suggest a preferred manufacturer, which is against the country’s public procurement law. In six tenders, the final value of the tender or purchase exceeded the amount which was planned. The Bosnian Serb Interior ministry bought six used vehicles for more than 10,000 euros more than the estimated amount. In the rest of the tenders, the demanded specifics of the vehicle suggest or sometimes directly state a particular model or manufacturer, which is against the public procurement law. BIRN Bosnia published an analysis in December showing that around five million euros was spent on vehicles in 2017. After BIRN’s reports about violations of public procurement practices, several institutions amended their tender specifications. The database also contains a register for vehicles already owned by institutions and public companies, which shows that the average cost of a vehicle is around 25,000 euros. The Bosnian presidency and the two entity presidents own a total of 54 cars, worth around 1.7 million euros. The database can be seen here (Bosnian language only).